Inventory management software and inventory management practices are two sides of the same coin. Whether you manage one retail supply chain or a multichannel operation, for your business to run at peak efficiency, you need to optimize both. Just follow these guidelines to make sure your software is working its hardest for you, and discover the five things you can do to get maximum benefit from the system. When you fine-tune the way you manage your inventory, you’ll soon see it work for you. Whether you’re choosing a new inventory management system or trying to make the most of the one you have, here are seven tasks your software needs to handle with ease. The foundation of good inventory management is knowing what’s on order at any time. Your system should provide all the specifics—products ordered, purchase orders they’re on, delivery dates—whenever you need it. All on-order information needs to be as accurate as possible so you can keep your customer promises. And it must be available to your whole team—so everyone can help you replenish inventory. If you take pre-orders, you need an additional layer of sophistication. Your system should enable you to receive in-transit inventory into a temporary location, allocate sales from that inventory, and run stock reports on that location to see the quantity available for future pre-orders. When you sell on multiple channels, your stock level needs to be synchronized across the entire company—so you don’t sell the same products multiple times. You could pre-allocate inventory to each channel, but unless you manage each channel dynamically, that prevents you from selling all of your stock. A better way is to use inventory management software to make sure your stock levels on all channels match your actual on-hand inventory at all times. Any time your inventory changes—whether it’s because of sales, receipts, shipments, or returns—your software should update your stock levels immediately. That way, products aren’t sold twice and new products are available for sale as quickly as possible. Also, in its updates, your system should differentiate between inventory that’s “in stock” and inventory that’s “on hand” (what’s in stock less what’s already allocated to sales). Knowing your on-hand inventory in real time is critical since that’s the actual quantity available to sell. You should be able to search your system for products by name, stock keeping unit (SKU), universal product code (UPC), international article number (EAN, formerly European article number), international standard book number (ISBN), or bar code. That way, no one on your staff needs to rely on memory, which can be imperfect, to make all-important stock updates. For out-of-stock products, your system should display similar items to help you make a sale. If you sell products with multiple sizes and colors, a handy tool is the size/color matrix. It shows you all on-hand options on one screen so you can suggest alternatives to your customers. See the average lead time from your suppliers so you can decide if further sales are worth the risk. Continue to sell selected products—even after their on-hand inventory reaches zero. Occasionally, you may need to reallocate a product, so you need your system to show you all the details. Whether the item was just allocated to a new online order or an existing order is in the pick-pack-ship process, this information will help you make good choices about your inventory. 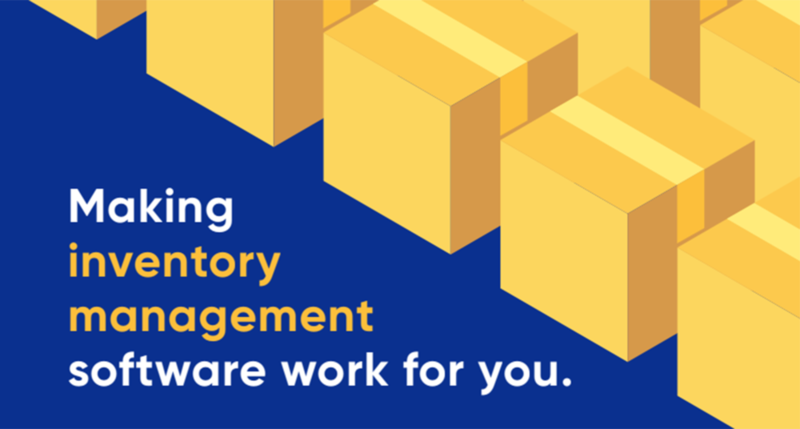 Now that you know what your inventory management software should do, here are five best practices for working with it. 1. Structure your product database for success. Maintain a single, unique SKU for each inventory item. Build kits and bundles correctly. Handle variants such as size and color properly. Understand the different units in which you may be buying and selling—perhaps pallets, crates, and cartons. 2. Get your whole team on board. Document your processes—Write down the correct processes for receiving products, shipping orders, dealing with conflicts, handling stock-outs, and so on. Train your team—Don’t assume that everyone understands the processes you’ve written down. Inventory management can be complex, so it’s always worth running through each process with your team to make sure you have explained it well and haven’t missed anything. A paper notebook—This works especially well in warehouses and shops where computers might not always be available. A shared Google doc—This enables anyone on your staff to add information from any computer. Just make sure you track who added the entry and when, in case you need to follow up later. 4. Listen to your system. If it says to pick from a certain location, pick from that location. No exceptions. If there’s nothing to pick, set that shipment aside and correct the system first. If your software says you have zero of a product on hand—because all of them are allocated to sales—don’t ignore the warning and sell it anyway. When a walk-in customer wants to buy the last of a product that was sold online a few minutes before, don’t sell it again. Instead, suggest an alternative. Being face-to-face puts you in a good negotiating position. If you have to bypass the system, add a note to your hot list and fix the problem as soon as possible. 5. Check your system every day. See that received products are entered into the system. It helps to maintain a folder for your supplier delivery notes with two sections: “received” and “not entered.” Then, at the end of the day, make sure the “not entered” section is empty. Check that shipped orders are recorded. You can double-check this by creating a goods-out area where you keep all packed orders. If, at the end of the day, this area is empty, there shouldn’t be any open shipments in the system either. Resolve any sales of “miscellaneous items.” These are products that you sold but couldn’t match to items in your system. Labeling them as “miscellaneous items” is a great short-term fix—when the customer is waiting for you—but you should sort them out daily. Complete any transfers between stores or warehouses. They are as important to manage as goods-in and goods-out. If you have a place for quarantined inventory, reconcile what’s there with your software to make sure you aren’t losing anything. If the products are suitable for resale, get them back “on hand” as soon as you can. See that your hot list is empty. An out-of-control hot list can be a sign of larger problems. Catch issues early! Making the most of your inventory management system and practices comes with big payoffs. From optimizing stock levels, and making informed cash-flow decisions, to keeping customer promises and increasing profits. These guidelines from Brightpearl will help you to put inventory management to work for your business.